Park means a park, golf course, playground, beach, recreational center, recreation area, conservation area, preserve or any other area in the county, owned or used by the county, and devoted to active or passive recreation, as designated by the board of county commissioners, and includes all entryways, parking lots, pools, water bodies, maintenance structures and similar areas or structures within or adjoining such parks. Assembly means a group of persons gathered together for some purpose such as deliberation, legislation, worship, or entertainment. Pets prohibited. Other than authorized staff or law enforcement personnel, no person shall bring or introduce into a park any off-leash dog, cat, snake or other animal other than in those areas specifically designated for activities involving such animals. Notwithstanding the foregoing, a person may bring a dog into any park, so long as the dog remains on a leash and under the owner’s control at all times, except for county beaches (including adjacent sidewalks, paths, trails, and RV and general parking areas), athletic fields, or any other area posted “no dogs allowed.” Such owners are responsible for removal and disposal of any waste. Nothing herein shall preclude a person from using or training a service animal in a park as provided for in Florida Statute Section 413.08. Any person in possession of such animal is responsible for controlling the animal and cleaning up and properly disposing of any waste. At no time shall such animals be left unattended. Vehicle means any wheeled conveyance, whether motor powered, animal drawn, or self-propelled. The term shall include any trailer in tow of any size, kind or description, but shall not include any baby carriage, motorized or nonmotorized wheelchair, or other device required to allow reasonable access to parks or park facilities for persons with disabilities. Bicycles. (a)Confined to roads. No person in the park shall ride a bicycle on other than a paved vehicular road or a path designated for that purpose. Cyclists shall at all times operate their bicycles with reasonable regard to the safety of others and follow bicycle safety standards. (b)Designated racks. No person in the park shall leave a bicycle in a place other than a bicycle rack when such is provided and there is a space available. Wild animals, birds, etc. Unless specifically authorized by the county or to prevent imminent harm to a person’s life or safety, no person shall hunt, molest, harm, capture, frighten, feed, kill, trap, chase, tease, shoot, or throw objects at any animal, reptile or bird; nor shall any person remove or have in his possession the young or eggs or nest of any such animal, reptile, or bird. The county may permit hunting and/or fishing in certain designated and controlled park areas. Removal of natural resources. No person shall dig, damage, remove, displace or destroy any beach sand, whether submerged or not, or any soil, rock, stone, tree, shrub or plant, or down-timber or other wood or material, or excavate by tool, equipment, blasting, or other means. Exception is made for the building of sand castles or other sand sculptures, except that the sand used for such activities must not be moved from the general vicinity of its source. Refuse and trash. No person shall dispose of any paper, waste, garbage, trash cigarette butts, debris, or other litter of any kind on any county owned or operated park, beach or recreation area except in proper receptacles. Only such paper, waste, garbage, trash, debris or other litter as may have been created or accumulated in the use of a park, beach or recreation area shall be disposed of in such receptacles. Where receptacles are not so provided, all such material shall be carried away from the park by the person responsible for its presence, and properly disposed of elsewhere. Fires. Fires are prohibited in any county park, except in such grills, fireplaces, barbecue pits or other similarly designed fire-safe facilities or areas. Fireworks and explosives. In the absence of a duly issued permit under the Manatee County Fireworks Law, located at sections 2-21-86 through2-21-91 of this Code, and the permission of the director, no person shall possess or set off any fireworks or explosives in any park. Notwithstanding anything to the contrary stated herein, it shall not be a violation of this section for persons to transport across and launch from the beaches of the city nonmotorized vessels, including, but not limited to, sailboats, catamarans, canoes, and kayaks. Moreover, it shall not be a violation to use trailers, beach wheels, or other similar transport devices intended to transport the vessel to the water’s edge in order to launch the vessel so long as transport device is not mechanically or electronically powered. Games. No person in a park shall take part in or abet the playing of any games involving thrown or otherwise propelled objects such as balls, stones, arrows, javelins, or model airplanes except in areas set apart for such forms of recreation. Lights illuminating buildings or associated grounds for decorative or recreational purposes shall be shielded or screened in such a way as not to project a beam of light directly onto the beach area, or turned off between sunset and sunrise during the period of May 1 to October 31 of each year. Window treatments in windows facing the gulf are required so that interior lights do not illuminate the beach, or the property owners’ interior lights shall be off between sunset and sunrise during the period of May 1 to October 31 of each year, so they do not have to install additional window treatments. Any items or temporary structures, including but not limited to screen rooms, beach chairs, umbrellas and cabanas, which have the potential for entrapment of marine turtles and which may interfere with the use of the natural beach environment for nesting shall be: (1)Removed from the beach nightly by the owner of the property upon which the item or temporary structure is located. If the item or temporary structure is not located on private property, it may be tagged or removed by a code enforcement officer, or (2)Stored in areas designated by the city which are situated to avoid interference with marine turtles. Hey, I just graduated the 8th grade and wanted to throw a beach celebration. Would I be allowed to bring my own safe fire pit? I would have an adult present with the right qualifications. And if not, if I were to borrow a safe fire pit that belongs to the beach, would I be allowed to burn paper goods? Just old assignments that we won’t need, nothing toxic or with nasty odors. Congratulations. From my understanding of the regs you may not have any fires on the beach, only in the barbecue grills at Coquina Beach Park and Bayfront Park. I’m not sure if there are restrictions on what may be burned in them, but they are provided for safely cooking food, not bonfires. We will be visiting the Anna Maria Beach area in late January, 2015 and wonder if fishing is allowed from the beach or piers? Yes, fishing is permitted from the beaches and piers, and is very popular. The City Pier and Rod’n’Reel Pier have bait available. Watercraft use. We are renting a hosue on Anna Maria for a week and wanted to bring our jetskiis. if we are off loading from the ramps can we bring them around to the gulf side where we are staying so other in our party can ride them. do they need to be anchored off shore and if so how far. I can’t find reference to regulations but there is a swimming-only (or non-motorised) zone 300 feet along the whole shore of the Gulf beach. Several years ago floating markers were placed but many have since moved and some disappeared in storms. There is a popular PWC beach at the southeast end of Anna Maria Island, at Coquina Bayside Park near Longboat Pass bridge. I am looking to have a small get together at coquina park (8-10 people) the bbq grill area is not required to have a down payment like the pavilions correct? this is a first come, first serve basis? Yes. Lighting restrictions during turtle season apply to fixed illumination from buildings and to disturbing hatching nests with portable lights. You can enjoy the light from the rising moon and stars as your eyes adapt to low ambient light without a lantern. I am in the process of training my lab for dog therapy certification. I would like to rent a condo on Anna Maria beach in January, but want to know If I can walk her on leash on the beach? My dog will have her CGC certification and be most of the way to her therapy dog certification by January. 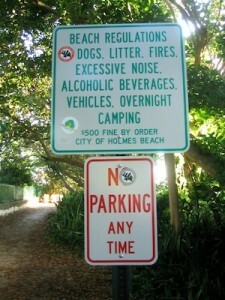 Can you give me information about what restrictions and/or permits are regarding dogs on that beach? Sec. 46-54. – Domestic animals. No person in a park shall allow the entry of a dog or other domestic animal into areas other than automobile parking concourses and walks immediately adjacent thereto, and such other areas as may be clearly marked by signs plainly indicating that dogs or other domestic animals are permitted in the immediate area. Nothing in this section shall be construed as permitting the running of dogs at large. All dogs in those areas where such animals are permitted shall be restrained at all times on adequate leashes not greater than five feet in length. No animal is allowed on public bathing beaches at any time. Nothing herein shall preclude a person from using or training a service animal in a park as provided for in F.S. § 413.08. Any person in possession of a service animal is responsible for controlling the animal and cleaning up and properly disposing of any waste. Can I bring a small tent 10×10. Grills are first come first serve? Can I bring my own? I have a small propane grill. Did I have to pay to use the grill? You can use a tent or canopy during the day but not overnight. The fixed grills are for first serve but I think you can use your own grill in the open cabanas, not on the beach. There is no charge to use the any of the facilities. Great beach! I wish I could live there while I go to IMG. How could I find cheap accommodation? Your web site helped me a great deal. I had been a little bit acquainted but now have a clearer idea.